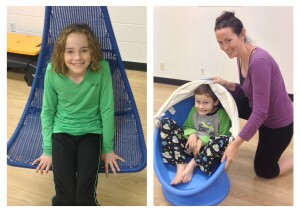 Heidi Guthrie, mom of Gigi and Dominic, is our guest blogger. Here, Heidi writes about the unforeseen changes she and her kids have experienced since they began Brain Highways eight weeks ago. The Guthries prove that any family member can change his or her brain. When we started Brain Highways, my husband and I really thought that our daughter was the one who needed the class. But we also enrolled our son because we thought . . . well, why not? So imagine our surprise when our son started making huge changes, and many of the things we thought my daughter needed to improve truly went away just by building into the structure. Turns out, we all really needed the class, least of all my daughter! Here are some changes we experienced after finishing the pons course and clocking 24 hours of floor time. For myself, the improvement in my vision was completely unexpected. After 25 years of continuously worsening vision, my vision in one eye has now improved one complete point (which is a big deal by this measuring assessment). My left eye now actually sees like it did 10 years ago! My daughter, Gigi, has improved her concentration. She used to resist reading of any kind, but she’ll now read without complaint and even asks to go to the library. Also, the bickering with her brother has vastly improved, and I see her trying to take care of business (a high level cortex way of expression that we learned during the course) when they communicate. At school, Gigi’s teachers have commented on her improved schoolwork, which is reflected in her grades. Gigi will now also sleep with the door closed (she previously had a distorted fear that the door had to remain open all night), and she has learned to stop trying to negotiate everything—she just goes with the flow. My son, Dominic, used to hold a book while looking toward the ceiling and “guessing” at the words. He now asks to read and does so daily without complaint. His teachers have noticed improved school work, especially commenting on how his handwriting has changed (we learned—and have now experienced—that poor handwriting can be directly related to retained primitive reflexes). Dominic also used to avoid eye contact while talking. But now, not only has his eye contact improved, but his optometrist also says his eye tracking is spot on. At home, Dominic doesn’t provoke and needle his sister like he used to. He is more forgiving of himself when he makes a mistake, telling himself and others that they’re just “wrapping myelin.” I actually haven’t heard negative self-talk from him in over a month. Dominic’s teacher shared with me that she overheard him telling his classmate that negative self-talk is a “never-ever” and then showed his classmate how he could just “slip-n-slide” those thoughts away! Dominic has also taken to heart something else he learned during the pons course. Dominic won’t allow anyone to start a positive sentence and then say “but” and then continue with that thought, without letting everyone know how doing that just erased anything positive that was said in the first part! Lastly, did I mention . . . no more whining!!!!! So, what’s next? Well, on to developing our midbrain! Ironically, that’s actually the class we thought we’d see some changes in when we first began. Little did we know . . .